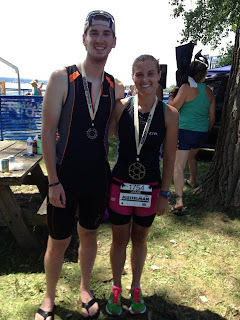 Did you miss the swim and bike legs? 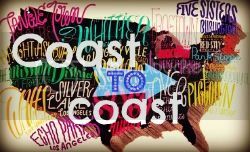 Check them out here and here. 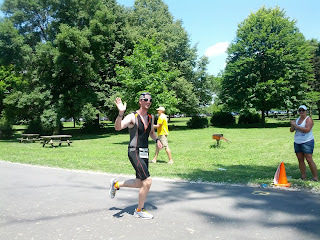 I came into transition after the bike and grabbed all of my running stuff and made my way out onto the course. 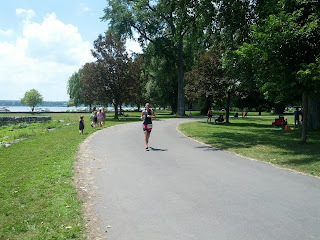 Volunteers wished me luck by name, our names were on our running bibs, and I ran on the path along the lake. I got a little emotional when I saw it and said, "aww it's my Bern!" As I ran by them Amber told me to have fun and I said, "it's hot". I had to tell myself to slow down the first mile, I hit 8:59 and knew I really needed to slow down or I wasn't going to make it. I drank from my handheld, it was warm, and poured some of the water on myself. I told myself to try to make it 3.1 miles before walking and I was doing a pretty good job. 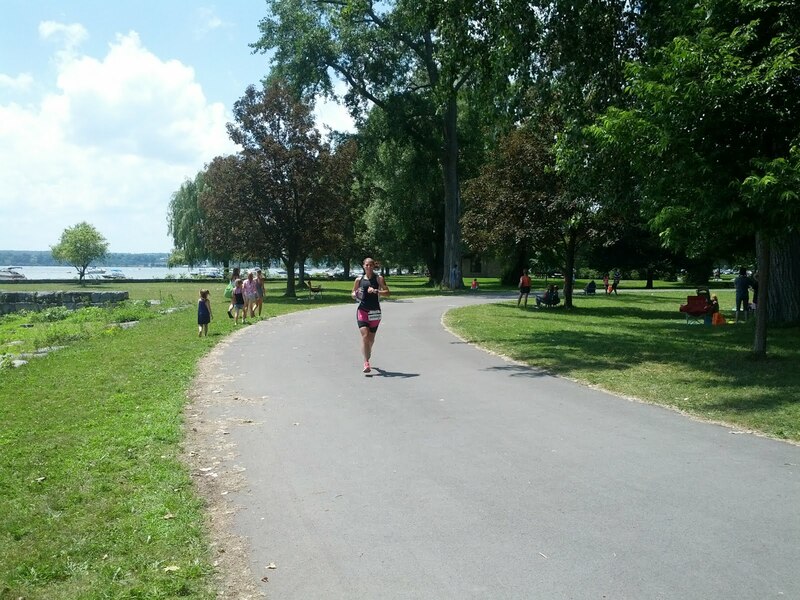 As we ran along the race course, similar to the last leg of Seneca7, I could see people running toward the finish line. 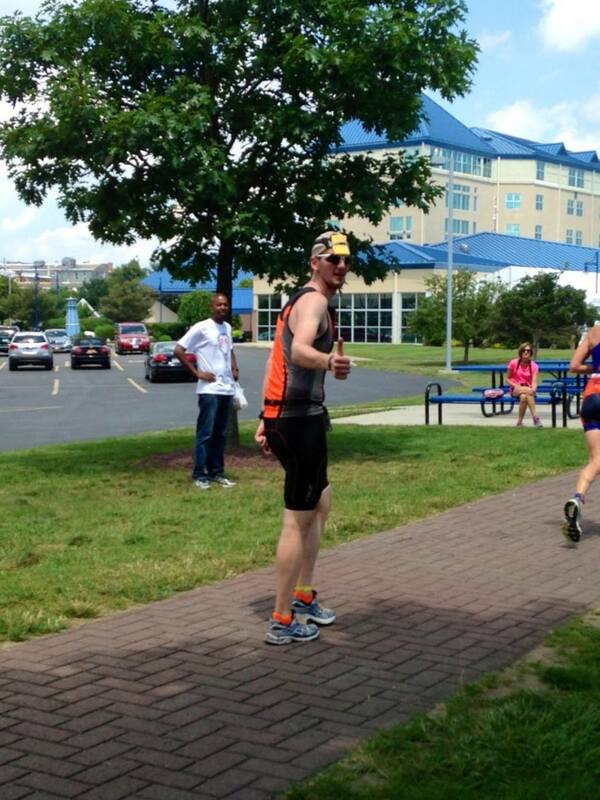 I didn't think I would see Mike out on the run course but I still looked out for him anyway. A spectator told me I looked good and I continued through Lakefront Park. 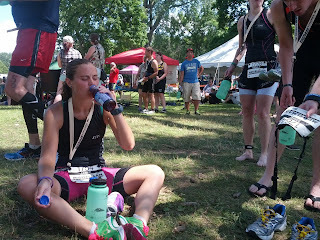 I got to the first water stop and took some water and poured most of it on myself. I had slowed my pace down but I was still running. Until I got to the second aid station at about 2.5 miles and then I got stuck behind people and I was forced to walk. I tried not to let it interrupt my flow, but I started walking a lot after that point. We made our way up a grassy hill, I walked, and then there was another aid station. I took more water and dumped it on myself. This is when people started to offer to spray us with hoses and I took up any offer that I could! My watch freaked out on me and went into time/date mode, but luckily I was able to get it back to training mode and locked the bezel. Around 4 miles we ran by Houghton House and there was a group of musicians that were playing music in this area, but when I went by they were taking a break. The music they had playing during the break was very somber and someone said, "this sounds like death march music". I agreed and noted that peppier music would be better. Right before the mile 5 aid station, I took my first (and only) energy gel. It was so warm that it was spewing out of the packet, but I got most of it down. I dumped out my water bottle and refilled it with cold water and ice at the aid station. The next point I told myself to get to was 6.5 miles, because then I would be half way. I trudged along, alternating between walking and running, and focused on trying to keep as cool as possible. I had to walk up most of the hills, but it was a survival technique since I don't do well in the heat and it was approaching 90 degrees outside. My slowest mile, I'm assuming, was mile 7. There was a huge gravel hill that I had to walk up and at this point I started chatting with a Towpath bike triathlete (the shop where we bought our bikes). He said that it was too hot for this stuff and I agreed, but said we could do it and it wasn't as bad as a marathon. When we made it to the top of the hill there was a reggae group playing music and a downhill approaching. 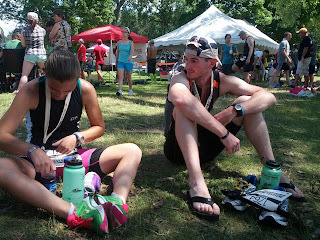 I forget when I did it, but I took HEED at one of the aid stations and it messed up my stomach. I made sure to drink a lot of water after to try to get it to settle and that's when I knew my second energy gel at mile 10 wouldn't be used. The next mile mark I wanted to hit was 8.5 miles, and then I wanted 10 miles, but unfortunately around 8.05 miles my watch died. It had been saying low battery for a little while and then it finally went blank. I figured that would happen since I had been messing with it to see what time it was a few times. I walked up a hill around 9 miles and got to the aid station. I had dumped out the water in my handheld and wanted to refill it, but when I got to the station there wasn't any water! They were filling it in a bucket and I filled my bottle with a few cups of ice and as soon as they were walking the bucket over I walked over and dunked my handheld into the bucket. I didn't get much water but it would get me to the next aid station. 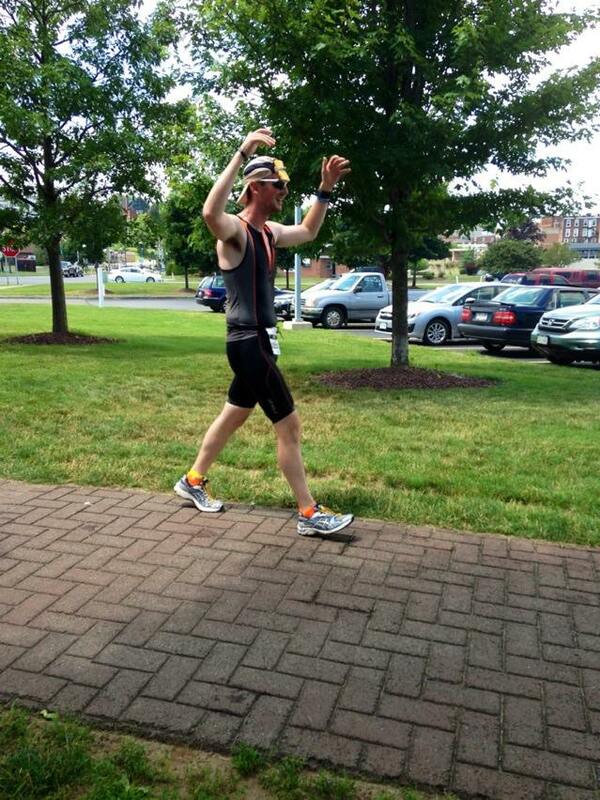 At mile 9.5, I found out later, I was running down a hill and heard someone in the distance say, "go, Jamie!". I didn't recognize them at first but as I got closer I saw Sarah, Mark and their dog Kiva. They picked up my spirits and cheered me on as I ran by. At this point I knew we were getting close to the part of the route we had already run on and I said to a guy near me, "we're almost back to familiar territory". We turned right and ran along the sidewalk and at the mile 10 aid station I grabbed more water. I wished I knew how I was doing, but since my watch had died I had to just keep moving forward. We ran down a hill, not the grassy one, and back down onto a dirt area and through a tunnel to Lakefront Park. 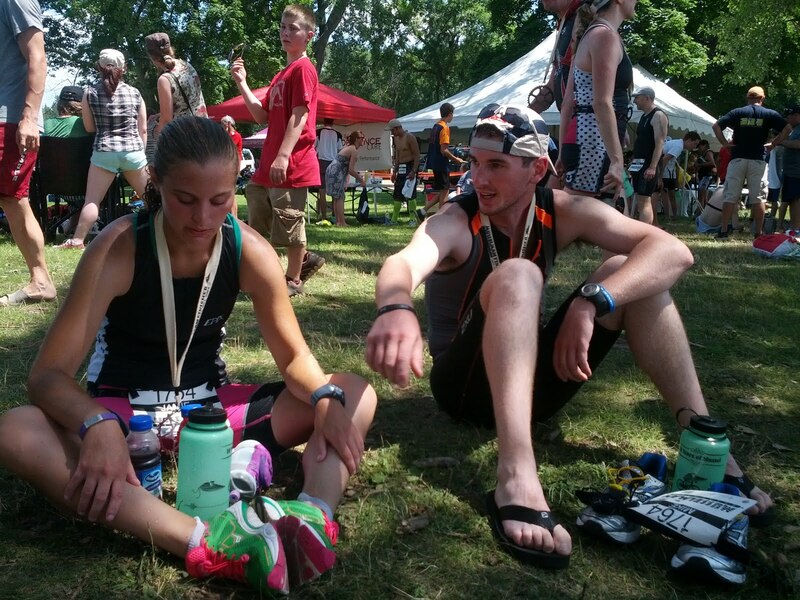 At the next aid station I refilled my handheld one more time and poured some water on myself. I was walking and then I saw Sarah and Mark again. Sarah said that the cool water must have felt good and I said hi to Kiva as I walked by. Since they were right there I didn't want to walk for too long and I got myself moving again, though briefly. The final 2ish miles were tough. It was so hot and I made really small destination goals, and didn't always make it while running. I felt like I was walking a lot more than running but at least I was moving. I grabbed some water at the last aid station and someone asked if I was alright, I could only nod yes. I only thought that I didn't want to be moving anymore around the 12 mile mark. I kept running and thought, just get to that tree, that sign, etc. I made it to the park and found the last spot I was going to let myself walk to and started to run. 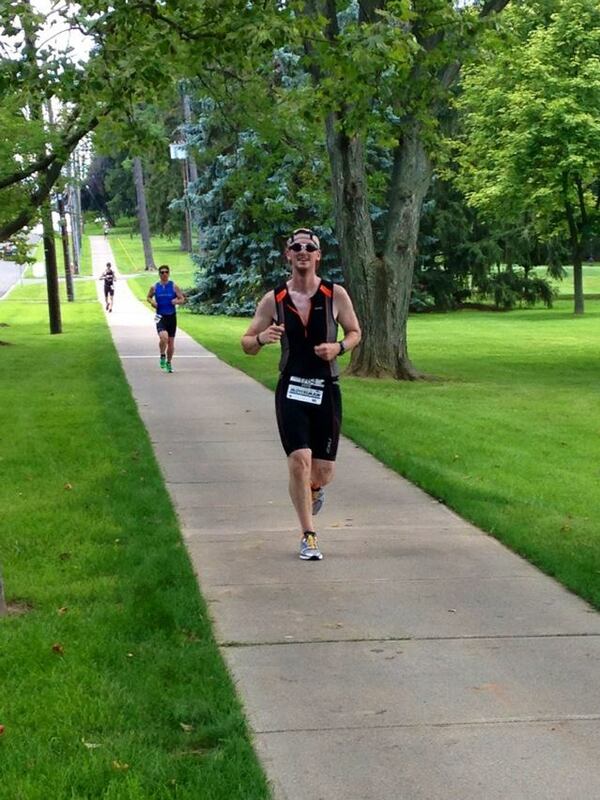 I was less than a mile away from the finish line and as I rounded the corner, there they were. My people. I saw Greg first and then I saw Mike and Amber. Amber was holding the Bernie sign and Mike had a medal around his neck (which made me pump my fist). I saw Mike's parents who had come to see the finish and they said I looked strong. I laughed on the inside because I thought it was because all of the walking I had done. I approached the finish line and saw the time. I heard my name called and I crossed the finish line. I had done it! I was a Half Ironman! I got my medal and glow in the dark Nalgene bottle and almost walked away before they cut my chip off of me. Someone asked me if Mike's mom was my mother-in-law and I barely could get out yes and they said they heard my name called and knew Mike's mom. They congratulated me and I got out a thank you and found a spot to sit down. I hoped that everyone would just come find me. I saw Amber and Greg and Amber handed me a cranberry juice, and then Mike and his parents came over. Mike sat down next to me, we kissed and then everyone said congratulations. I was hot and tired still, and not feeling the greatest but overall I was happy. We had done it! Mike told me how his bike went (fast!) and he said he had finished under 6 hours. We took a few photos, got our stuff out of transition, packed up the car and then headed home (we didn't even change out of our clothes). This was an amazing, challenging, rewarding experience. I can't thank our support enough. 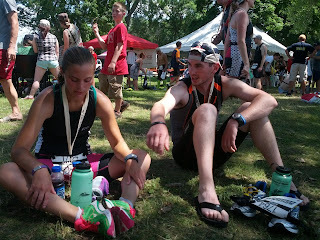 Seeing Sarah and Mark on the run made a huge difference, I probably would have been slower if it wasn't for them. Mike's parents drove to see us finish and we really appreciated it. Amber and Greg. What else can I say about them that I haven't said before? They are amazing. Their smiles, the signs, the photos, texting everyone (including my parents who couldn't make it) about our progress, giving us juice and chocolate milk at the finish and being there ALL DAY (they woke up earlier than us on race day). I can't thank them enough. We would have finished without them, I know we would have, but them being there made it so much sweeter. We owe them a lot. We're going to owe them more because if I know them, and I do, they are going to make the trek to Louisville next year to see us become Ironmen. Not many people would do that. We had an amazing weekend, thank you to those who sent well wishes, congratulations, etc. 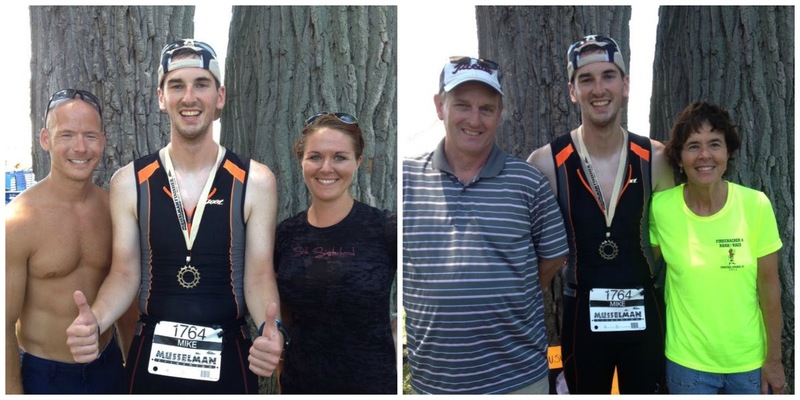 Mike overcame a bike crash and became a Half Ironman and I couldn't be more proud. We are going to do even better next time! Jamie, I love these reports. Congratulations. It has been great watching the training you and Mike have done. You both overcame allot to get to the finish line. I have to admit as you talked about getting to the finsh line it gave me goosebumps. I can picture it.Mine is 4 weeks away. Congratulations to you and Mike. I am looking forward to wathcing your IM training. Aww thank you so much Bill! 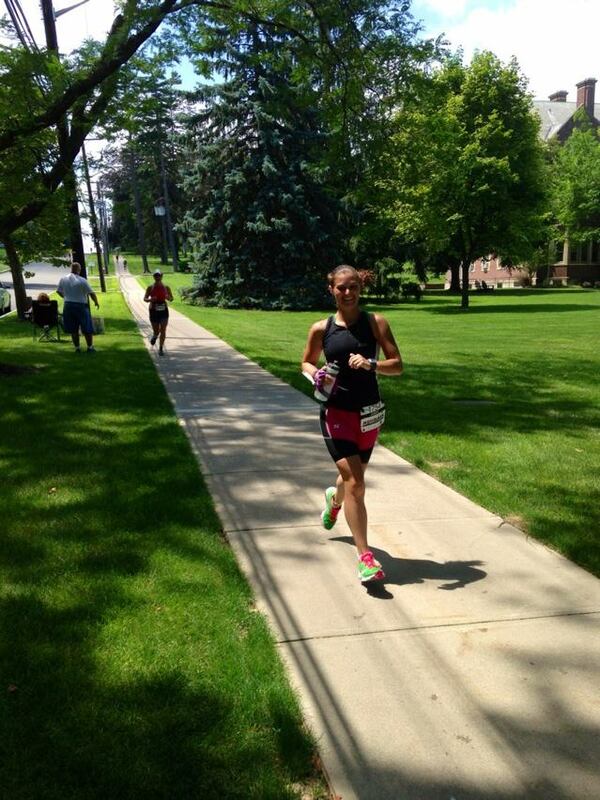 You are going to do great at your 70.3! Again, a million congrats! I was just thinking how far you have come in the tri world since I first started reading your blog a zillion years ago :) You did so great! Great job, Jamie and Mike! As a still-aspiring marathoner (that title is scheduled to change in January), a half or full ironman are not things I can fathom at this point. Be proud! Congrats on finishing so strongly! I'm amazed at people who can do any triathlon, let alone a 70.3! 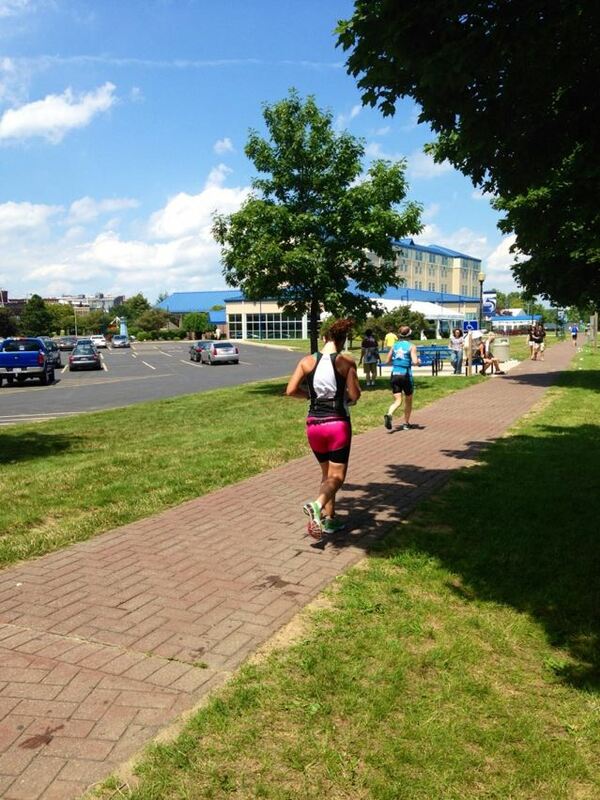 any run in triathlon that is long than 3 miles is a death march. (not that a sprint or anything shorter isn't a tough race but getting through 13 miles in tough weather is rough) great job. i am doing my 4th half ironman next saturday and i am not looking forward to the run, given the weather these days. Congrats to you both!! I am so inspired by your determination!! I am just beginning my triathalon journey with a sprint distance in a few weeks!ci loved hearing your story! Way to rock it out!! WOoHoo! COngrats to both of you. Very strong finishes! Awesome job!! You both did so amazing... it's inspiring!! It sounds like you ran a smart race! Congrats! 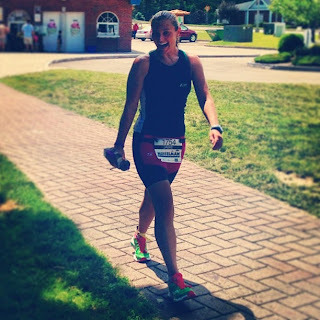 Did you feel like one leg of the 70.3 was your strongest? Your favorite? You are my hero, lady! The swim was my favorite and strongest, though all were great. The run was so hot that I can't say that it went as well as I would have hoped, but now I know and next time I can push it! You were definitely in the right place at the right time!! I have gotta find a way to get to Louisville!!! ha! I just don't know where the heck we will be living then. 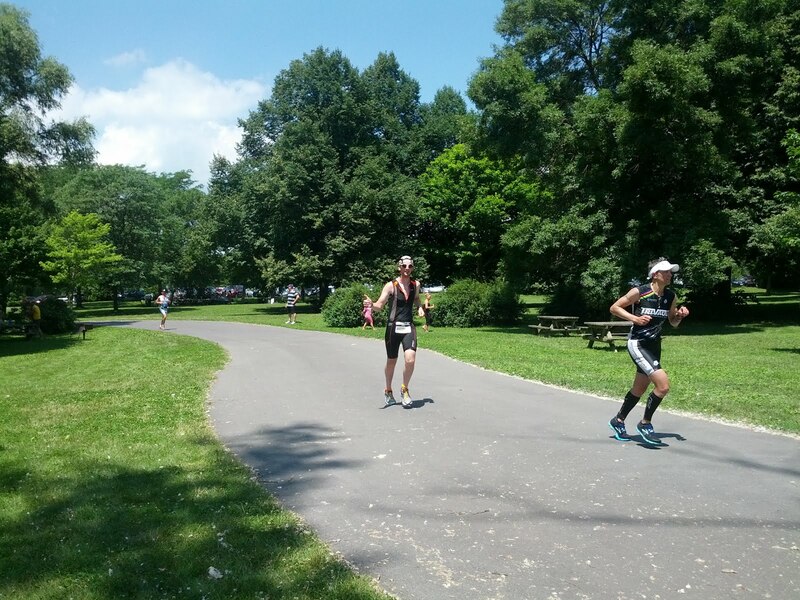 You both looked incredibly strong during the race. 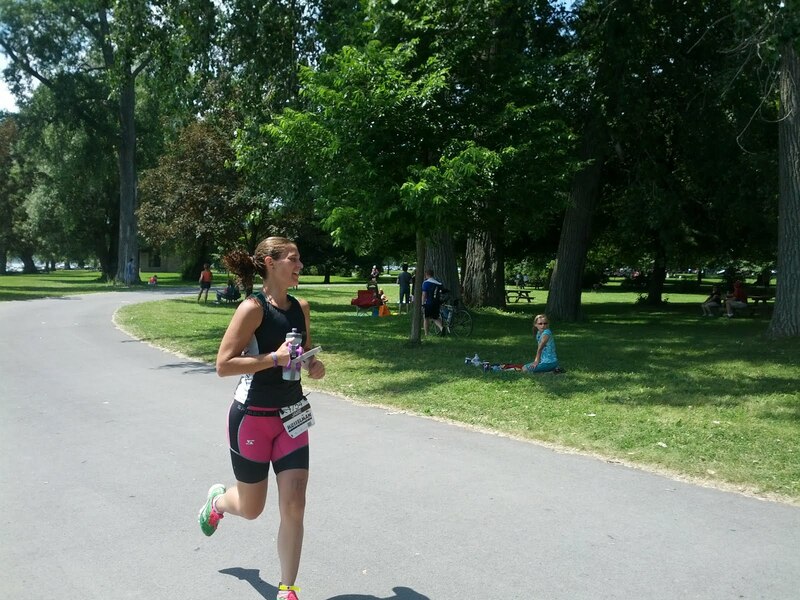 I'm proud of you physical and mental strength to just keep pushing, especially in that INSANE heat. You have come so very far and are only improving and becoming better. Congrats dear friends!! Congratulations and thanks for doing these awesome race reports. It's a real inspiration to me. 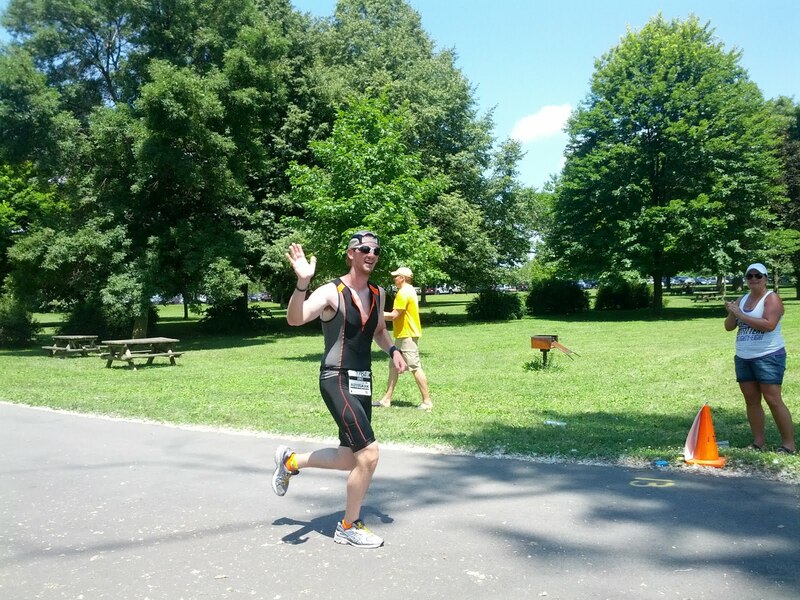 I've just started getting into triathlon but I hope to work my way up to longer distances. Jamie, I'm so proud of you--congrats, congrats, congrats! Again, great job and great Geneva/HWS pictures. :) I talked to my coworker about the drum/bongo music, and apparently the idea was the musicians would drum faster the faster that triathletes were moving; so jogging would be mellow, but running would be upbeat. That's what I heard anyway. Hope you and Mike are soaking in the experience and resting up big time! Holy crud. I cannot even imagine doing a race that takes that long. And your times were fast. I'd be there all day. You are so dedicated and awesome. AAAAAHHHHH!!!!!!! YOU DID IT!!!!!!!!!! I just read them all at once and now I'm crying because I'm so freaking happy for you. Also, as soon as I saw the puppy poster, I was done for. You did amazing girl!!!! Can't wait to see what's next!!! Aww, thank you Ari!! 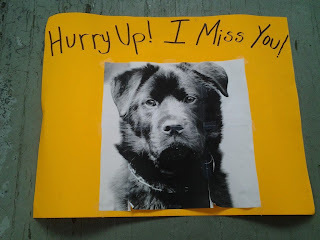 We really need to meet!! Congratulations Jamie and Mike! What an accomplishment! I'm sure that you were frustrated with the walking, but I've heard from almost everyone I know that it just happens and you just deal with it. You're also the third person now I've heard say it isn't as hard as a marathon! That's reassuring to me! I'm thinking of signing up for a half Ironman for the fall (I'm actually following a training plan and am in week 4 already...) Congrats! Wonderful job on your run times! I know that must have been tough to do in the heat and after swimming and biking.